During the course of a Twitter conversation with Dr Rachel Pope the other night, an unusual facet of hillfort excavation arose. 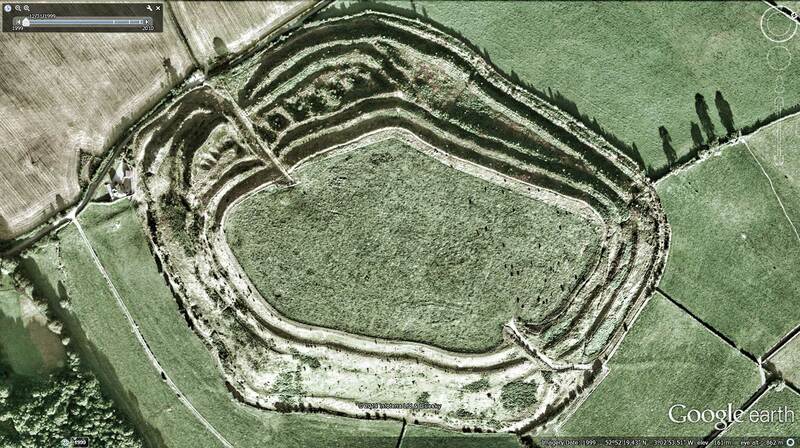 Hillforts are, as is often remarked, usually the most prominent prehistoric structures in the landscape. But for all their familiarity, only a tiny percentage have been excavated, and an even smaller percentage have been excavated in a meaningful, methodical fashion. Interiors, until the late 20th century, were barely touched at all, and yet when they are excavated, the archaeology (when present) is usually far richer than is found in the ramparts, where excavations traditionally took place. 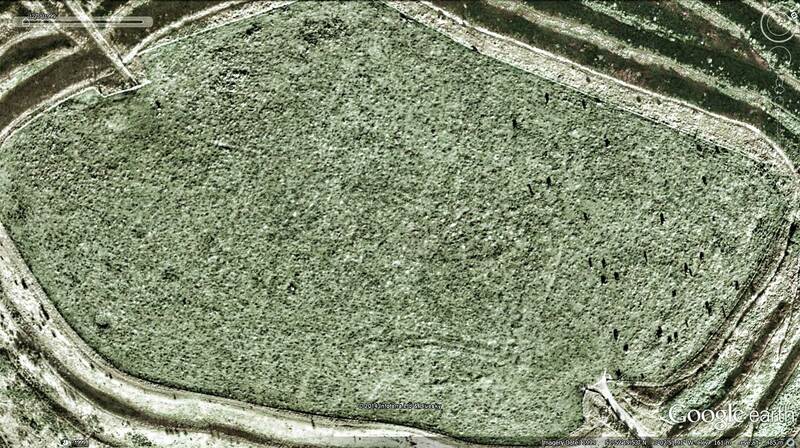 Old Oswestry hillfort – WWI trench lines visible. Image © Google/Getmapping. 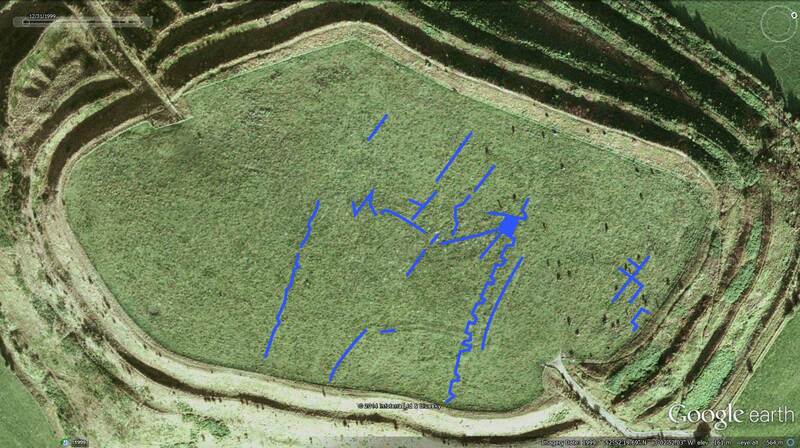 Old Oswestry hillfort – WWI trench lines in blue (partial and approximate). Image © Google/Getmapping. Anyway – back to the exchange. We were talking about Old Oswestry hillfort, and the practicalities of creating a digital reconstruction. I joked that if someone went and excavated the interior, I’d then give a model a go. Then it occurred to me that someone had already dug the interior – or rather a great many people had. Old Oswestry hillfort, like a number of other hillforts, was used as a location for trench warfare practise during the First World War. They were discreet, out of the way places, which were also – conversely – easy to find. Trenches – deep trenches – zig-zag across the interior of Old Oswestry, The Caburn, and a fair number of other hillforts. Are there any records of these very un-archaeological excavations? What did they find when they were digging? Who, most importantly, would be able to tell us? If you have any ideas, please get in touch through the comments section below. Hi Henry, suggest you contact Heather Sebire at English Heritage. We chatted about the trenches – the only complete set of training trenches in Europe – on top of Old Oswestry; and I think EH are planning some work up there at some point soon. Thankyou John – I certainly will. Will keep you posted. Hve a look at the topogr survey published by Nicky Smith for English Heritage in 2010, This plots out the lines of trenches and link trenches between them. What has interested me is that a couple of the new aerial photos taken for HOOOH, and on their facebook page, show the trenches in very good detail. Training trenches were all planned to 2 main layouts, which were exactly what the troops would find once in a war situation. There is a small exhibition in Oswestry Museum. Yes EH have plans, but there are also plans to build some more trenches in Park Hall as part of an Oswestry Museum WW1 Project. Thanks for that Maggie – I used Nicky Smith’s report as a source for this page – http://www.digitaldigging.net/old-oswestry-hill-fort/ – I’ll see if I can find out what EH are planning.